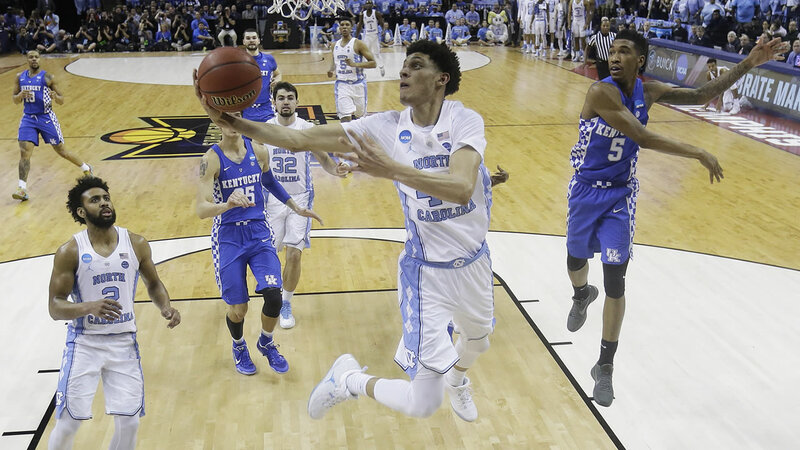 MEMPHIS, Tennesee (WTVD) -- The South Regional final looked much more like the game so many expected from North Carolina and Kentucky in the second half with Kentucky taking the lead at times. In the end, UNC had what it took to put the Wildcats away 75-73 to advance to the NCAA Tournament Final Four. Luke Maye hit the game-winning shot with just 3 seconds left on the clock. "You got to congratulate Kentucky," offered UNC Head Coach Roy Williams. "But my guys are pretty dog gone tough too." The Tar Heels take on Oregon Saturday in Phoenix. On the other side of the Final Four, Gonzaga takes on South Carolina. It's Carolina's second straight trip to the Final Four and 20th all-time in Sunday's showdown of college basketball's elite in the South Regional. North Carolina took control with a 12-0 run within the final 5 minutes. Kentucky's freshmen De'Aaron Fox and Malik Monk hit three quick 3s, the last two by Monk and his second with 7.2 seconds left tied it up at 73. Theo Pinson brought the ball down, passed back to Maye. The sophomore from Huntersville, North Carolina, knocked it down for the win with his feet on the 3-point line. The Wildcats had one last chance, but Derek Willis' inbound pass went out of bounds on the far end. Kentucky (32-6) will miss out on the Final Four for the second straight year. Willis and sophomore Isaac Humphries left the court with towels over their heads, and Fox was the last to leave. The Wildcats had hoped their talented freshmen would carry them. Bam Adebayo and Fox each had 13 points, and Monk, the Southeastern Conference player of the year, finished with 12. Never before had the NCAA Tournament pitted powerhouse programs that have so dominated March. This South final featured Kentucky with the most tournament wins all-time with 124 and North Carolina just behind with 120. But this was just the fourth time these blue bloods have met in a regional final. The result was much the same as the others with North Carolina now 3-1 against Kentucky as the Tar Heels avenged a 103-100 loss on Dec. 17 in Las Vegas. Kentucky led for only 3:57 in a game North Carolina had a big edge on the boards (44-34) and inside where the Tar Heels outscored the Wildcats 34-26. Officials didn't help the flow of this game calling fouls left and right, though Kentucky took the brunt with its star trio of freshmen all picking up two fouls each in the half. Fox played only 8 minutes of the first half after picking up his second foul with 12:23 left. Adebayo easily was the most frustrated as he missed all five shots in the half with Kennedy Meeks swatting away one of his attempted dunks. North Carolina led by as much as nine a couple times before both teams went into shooting slumps. The Tar Heels led 38-33 at halftime.